Bandai Namco Acquires Nippon “Bluefin” Imports! Exciting news for collectors this morning! Bandai Namco Holdings has announced the acquisition of a controlling stake (80% of shares) in toy distributor Nippon Imports LLC– best known under their trade name Bluefin. A new subsidiary will be developed as a result- currently titled Bandai Namco Collectibles– and operations are tentatively scheduled to begin in January 2019. The motive for this purchase is to strengthen Bandai’s merchandise sales in the North American toy market, taking advantage of Bluefins’ extensive experience with USA distribution and collector events. This is definitely an exciting time for Bandai fans! A new deal could mean greater access to Japanese exclusives for US fans, OR some positive changes to current distribution methods. 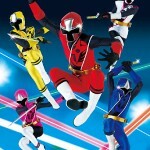 Stay tuned to TokuNation as we keep you up to date on this exciting business deal! We’ve reported earlier that the upcoming Kamen Rider Climax Fighters game would be receiving a southeastern Asia localization, meaning the game would have English subtitles and menus. The first pre-orders are beginning to pop up for that version of the game. Play-Asia.com currently has the game available for pre-order at $53.99 prior to shipping. 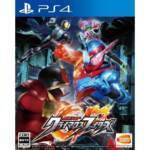 Simply click here to pre-order Kamen Rider Climax Fighters. Kamen Rider Climax Fighters releases on December 7th, 2017 for the Playstation 4. 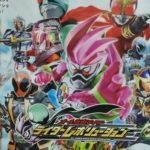 All Kamen Rider: Revolution Video Game Announced- Coming To Nintendo 3DS This Fall! A new Kamen Rider video game has been announced for the Nintendo 3DS system! All Kamen Rider: Revolution is described as a side-scrolling action game featuring a variety of Riders and combat styles. 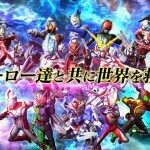 Riders confirmed to be included in Revolution so far are: Kamen Rider 1, Kamen Rider Amazon, Kamen Rider Kuuga, Kamen Rider Ouja, Kamen Rider Fourze, Kamen Rider Meteor, Kamen Rider Gaim, Kamen Rider Drive, Kamen Rider Mach, Kamen Rider Chaser, Kamen Rider Ghost, Kamen Rider Specter and of course the newest Rider, Kamen Rider Ex-Aid. All Kamen Rider: Revolution is currently slated for release in Fall 2016! Credit to our fine friends at Rangerboard for alerting us to this one. Bandai Namco has just revealed/announced an upcoming Nintendo 3DS eShop Kamen Rider Ghost game! 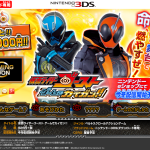 Titled Kamen Rider ghost: Game De Kaigan, this 3DS game will be a download exclusive title. Priced at 1000 yen it’s targeted for a Winter release, no further specific details are available at this time. We’ll keep you up to date as we learn more about Kamen Rider ghost: Game De Kaigan! You know those things that are all popular here in the United States? We’re talking Skylanders, Disney Infinity and Amiibo, or whatever? Well, Bandai Namco released something very similar in Japan for their popular Kamen Rider series – a game for the PlayStation 3 titled Kamen Rider Summonride, where you can switch between various Kamen Rider characters as you battle hordes and legions of bad guys. 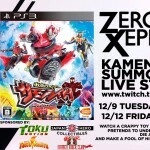 Our good buddy and incredibly famous YouTube Toku Reviewer ZeronXepher will be hosting a live stream via Twitch.TV this week as he plays through the game for he has purchased it. Don’t miss out on what promises to be a fun play through! Can he pull in more viewers than the Power Rangers Super Megaforce Extended Legendary Battle? Probably – stats show no one watched it on television! Be sure to follow @ZeronXepher on Twitter and be sure to ”Like” ZeronXepher’s Reviews on Facebook!